Given the choice of making a new click, or soldering the existing piece, I chose to repair the existing piece in the belief that the solder would be more than strong enough for the strain that the click’s tail would see in use, especially if the internal stresses generated by the sharp angle in the pieces design were eliminated. 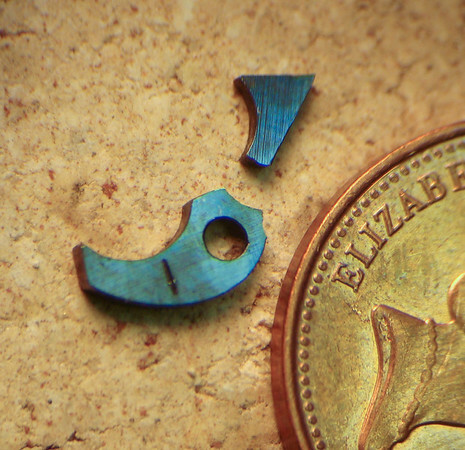 Fortunately the click’s break was very clean, leaving a granular face on both parts. These faces fit together perfectly. After cleaning the two pieces, one was placed on a firebrick such that it touched a small magnet. The small piece that broke off was then fitted to the first piece in exactly the same position that it occupied before being broken off – as shown in Figure 10.